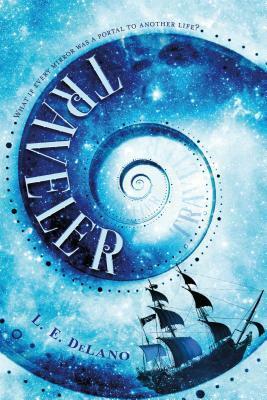 Traveler (Traveler #1) by L.E. DeLano. Publication: February 7th 2017 by Swoon Reads. A teen writer discovers that every mirror is a portal into an alternate version of her life in this romantic YA fantasy by author L.E. DeLano. Jessa has spent her life dreaming of other worlds and writing down stories more interesting than her own, until the day her favorite character, Finn, suddenly shows up and invites her out for coffee. After the requisite nervous breakdown, Jessa learns that she and Finn are Travelers, born with the ability to slide through reflections and dreams into alternate realities. But it’s not all teacakes, pirates and fantasy lifestyles…Jessa is dying over and over again, in every reality, and Finn is determined that this time, he’s going to stop it… this Jessa is going to live. When I started writing TRAVELER, it ran like a movie in my head. I often walked around acting out scenes (I have a Theatre degree – can’t help it) and along with all these scenes playing in my head and in my living room, goes the soundtrack. Here’s a little glimpse of the songs I’d use to score TRAVELER. 1-Rihanna, Love on the Brain. Finn is a secret obsession for Jessa, having taken over her dreams, and the pull of him when they first meet is both frightening and insistent. 2-Rusted Root, Send Me On My Way. This song perfectly sums up how Jessa’s brother Danny just keeps rolling along, and the carefree, openhearted love he shares with his little sister. 3-Iggy Azalea, Fancy. I heard the chorus of this song in my head during Jessa’s first time traveling. She goes to an opulent, glittery world where everything is kind of over-the-top and it just fits so well. 4-Joan Jett & The BlackHearts, I Love Rock ‘n Roll. I know it’s old-school, but that opening riff is what I imagine when Jessa first steps back and gets a load of Pirate Finn. 5-Mr. Big, To Be With You. This is Ben’s song. He and Jessa had a good vibe and were building on a good thing – until Finn rolled into town. This song captures his frustration and irritation so well. 6-Lisa Mitchell, Pirouette. This song is fundamentally Jessa: her confusion, her fears, her insecurities, and the way she finally begins to let go to reach out to Finn. 7-M.I.A, Paper Planes. When I think of Jessa’s traveling, this song comes right into play. I can just see her stepping through mirrors and a montage of all her various lives. 8-Augustana, Boston. The instrumental on this is just gorgeous, and I’d love to use it in the background on some key scenes. 9-Adele, To Make You Feel My Love if I were to pick a theme for Jessa and Finn’s love, this would be it. 10-Lifehouse, From Where You Are. This song perfectly sums up the last quarter of the book, and the myriad of feelings in those final scenes. 11-Bob Marley, Three Little Birds. Jessa is and always will be rooted by her love for her family. This song, like the book, ends on a hopeful note and it perfectly captures Jessa, her Mom and her brother. So there’s my soundtrack for the movie that was running in my head all through the writing of TRAVELER. I’d love to hear your soundtrack suggestions, as well! L.E. DeLano is a YA novelist rep’d by Barry Goldblatt Literary agency, author of the upcoming “Traveler” (Swoon Reads/MacMillan 2017) and lifelong writer. Her work has been featured on various online outlets and she lives in Pennsylvania with two very adventurous kids and two very ridiculous cats. In her spare time, she writes (of course) and binge-watches way too much Netflix. i love the cover. It also sounds like a great book. thanks!